When you were starting out as a DIY-er, you probably found yourself buying a jigsaw as one of your first few tools. That is no surprise because the jigsaw is very easy to operate and can be used for any application provided that you know which blades to use for which material. The purpose of this guide is to take a look at and compare some of the best jigsaw blades out there. We will also go over some of the things you need to remember when shopping for jigsaw blades. The first time we used a jigsaw, we thought a single blade will work for just about any task at hand. Sure, we noticed that different blades had different types but we thought the only factors we had to consider when choosing blades were the thickness of the material. We thought it was as simple as using thinner blades with finer teeth for thin materials and wider blades with wider-set teeth for thicker ones. Needless to say, we ended up either making ugly, splintered cuts or completely ruining some projects (and sometimes, the blades themselves too). That was when we learned that the differences in lengths, widths, and tooth configurations among jigsaw blades corresponded to a wide range of different applications. Although a jigsaw is quite a powerful tool itself, it is really only as powerful and versatile as the blade it cuts with. If you do not use the right kind of blade for the work you are up to, your jigsaw, with its powerful motor and high-end specs, is totally useless. We have decided to hail the DW3742C blade set as the top contender for this roundup because it contains the widest variety of blades in terms of TPI and blade fabrication. The blades have 6, 10, 12, 18, and 32 TPI. Some are made of HCS while some are made with bi-metal construction. They also come in different lengths and are compatible with any DeWalt and Bosch jigsaws. We are putting the T5002 from Bosch at number two simply because we believe it is close to the DeWalt blade set in terms of versatility. Consisting of six blades that are compatible with jigsaws from other popular makers, the T5002 has a little bit for every purpose (which is the whole point of buying a set sometimes). They are all made of affordable, flexible, and sharp HCS that has a ton of uses. Blade sets usually just contain blades that cut through thin to medium-thickness materials and Hitachi is one of the few exceptions. This is why we decided to put it at the number three spot. It has an ultra-low 6 TPI and carbide-tipped blades that allow it to easily slice through abrasive materials such as FRP, hardiboard, cement-bonded particleboard, and similar materials. The other great thing about this set it that it comes with a 5-year warranty. A jigsaw is ideal for you if you shape wood often because that is what the saw does best. However, that does not mean a jigsaw can’t be used for any other task. It can do straight cutting, shape cutting, piping, and cross cutting on common materials such as wood, fiberboard, plywood, metal, plastic, and aluminum. Use the right blade and you can cut through anything that is not a boulder. If you have an old jigsaw and a set of blades that got bent or broken due to having poor quality or due to being used for the wrong material or type of cut, then you already have a firsthand experience of the frustration of using the wrong blade for the job. However, even a combination of the most powerful jigsaw and the sharpest blade will not “cut it” if not paired with good technique. Before you invest in an expensive jigsaw (or any other power tool, for that matter), make sure that you know how it works and how you can maximize it. As we mentioned earlier, there must be tens of different blade types in your local hardware alone. How do you know which ones to get? Here is a list of a few things you need to consider when shopping for jigsaw blades. There is a blade for nearly every type of material, including fiberglass, plexiglass, ceramic, glass, cardboard, leather, plaster, marble, metals, and more. Luckily, manufacturers have made it even easier to determine which material each blade is designed to cut. Most of the time, blades are labeled or color-coded to indicate the material it is best used for. The blade shank is the blade end that attaches to the saw. Some jigsaws are compatible with only one shank type while some accept multiple kinds. Some old jigsaw models may only be compatible with obscure or discontinued shank types like the bayonet. The most common shank types are T-shanks (rounded end) and U-shanks (like a “u” cut out of the blade’s end). T-shanks are the preferred type for jigsaws with quick-blade change features because they can be fastened to the saw without the use of tools. In addition, T-shanks are usually compatible with a U-shank-compatible jigsaw as well. On the other hand, U-shanks have to be manually attached to the saw using a locking screw, an Allen key, or some other tool. Your blade’s size should match your material and cutting style. As a general rule, the blade should at least be an inch longer than your material’s thickness. The cutting style is affected by the width and thickness of the blade. Longer blades are made thicker to keep them from bending and are better used for thicker materials. Meanwhile, thinner blades are relatively weaker than long ones but can make cleaner and sharper curves. This is what makes them ideal for cutting out delicate patterns. Blades can be made of various metals. Generally, the denser the blade, the thicker the material it can cut through. The most common blade materials include high-speed steel (HSS), tungsten carbide, high-carbon steel (HCS), and bi-metals. HSS can cut through moderately hard materials but can be vulnerable to heat. Tungsten carbide blades, on the other hand, are generally the most expensive of the bunch. This is because they can smoothly cut through the hardest materials such as masonry and are often used for specialty cutting. Finally there are HCS and bi-metal blades. HCS blades are cheap, flexible, and gentle enough to cut through softer materials. However, they tend to wear out the fastest. On the other hand, bi-metal blades contain both HCS and HSS. they are flexible and can handle heavy-duty cutting. They also last much longer than pure HCS and HSS blades. You want a higher TPI to cut harder materials and a lower TPI to cut softer materials. A higher TPI also makes smoother cuts compared to blades with lower TPIs. Most blades nowadays have either milled or ground teeth. Milled teeth are blunt, cut roughly and quickly, and generally last longer than ground ones. Ground teeth are sharper but cut a little slowly. However, they do cut fine edges. When it comes to blade teeth layout, we are commonly talking about four: wavy, reverse, side, and taper. Wavy teeth are designed to look like waves and make straight fine cuts. Reverse-layout teeth are ideal for cutting materials that splinter easily. Side-set teeth are perfect for making fast, rough cuts while taper-set teeth cut slowly but make very fine edges. 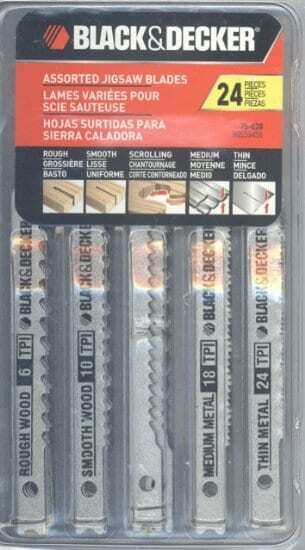 This pack of 24 silver jigsaw blades from Black+Decker contains wood- and metal-compatible blades. The wood-cutting blades work for general cutting work and have scrolling blades that can be used to cut out delicate patterns in wood. The metal cutting blades can cut through all metals including aluminum and non-ferrous metals. All of the blades in the set are of U-shank type and fit all universal jigsaw shanks. The scrolling blade design makes these jigsaw blades perfect for even the tightest scroll cutting work in wood and a long list of other applications. This variety cuts so smoothly you can even choose not to sand anymore. This is why scrolling blades are often used in cutting delicate material that you can’t afford to chip. They also last longer than most standard blade varieties. This blade set contains blades that can make both rough and smooth cuts on both wood and metal. There are pieces that can handle thin materials while some are strong enough to cut through wood and metal of moderate thickness and hardness. Overall, we believe this 24-pack blade set from leading manufacturer Black+Decker is a good buy if you are the type who regularly deals with general cutting work. The blades are not designed for heavy-duty cutting but are by no means weak. They can handle tough scroll cutting work and can cut through materials with up to moderate thickness. This blade set from Bosch includes six (6) wood cutting blades and four (4) metal cutting blades that are compatible with both consumer- and professional-grade jigsaws from other popular power tool manufacturers like DeWalt, Makita, Hitachi, Porter-Cable, Milwaukee, Craftsman, and Metabo. These T-shank blades are made of high-carbon steel, which is affordable and flexible, making the blades ideal for most simple cutting applications. The jigsaw blades included in this set are all labeled and color-coded to indicate the material they are designed to cut. This may be a small detail especially since there are only two kinds of blade in this particular set (wood and metal) but they can mean a lot when you are in a hurry and have no time to look at each blade’s teeth to determine what it cuts or if you are new to jigsaws and need a little extra assistance. As stated, the blades in this pack are forged out of HCS, which is known for being extremely flexible. This makes these blades ideal for cutting patterns out of wood. However, you want to stay away from thick materials as HCS blades are more suitable for softer and thinner materials. The T-shank design of the blades allows for a quick and tool-free blade change, which is important if you are concerned about downtime. Also, the fact that there is no hole and no screw to mount means there is less probability of breakage. 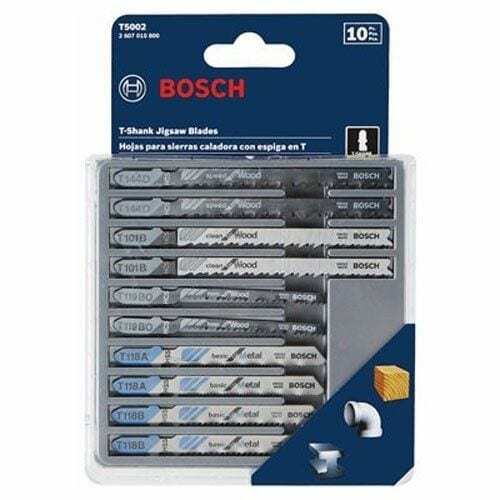 Bosch blade set is a nice addition to your toolkit if you are more into general cutting operations and are looking for an affordable but versatile set of jigsaw blades. Being made of HCS, these blades sure work for most cutting applications but should not be used for tougher cuts. The DW3742C contains 14 T-shank blades of five types (classified per TPI). There are 6-, 10-, 12-, 18-, and 32-TPI blades that come in different lengths and are suitable for cutting wood and metal. The 6- and 10-TPI blades measure 4 in long, the 12-TPI, 3.5 in long, and the 32-TPI, 3 in long. All blades save for the 3-in, 32-TPI ones are made with HCS material. The 32-TPI blades are made with bi-metal material. Finally, their T-shank design makes them perfectly compatible with all DeWalt and Bosch jigsaw models. Having both HCS and HSS, bi-metal blades give you the best of both worlds: They are flexible enough to make smooth curves on softer materials and can handle heavy-duty cutting at the same time. They also have a relatively long lifespan. The various TPIs that the blades come in allows you to use the same set for making smooth and rough cuts on both soft and hard materials, and everything else in between. Their different lengths also make them appropriate for use in cutting materials with varying thicknesses. Some of the blades included in the set are made with HCS material, which is very flexible and can be used to cut out even intricate patterns on thinner wood panels. The blades all have T-shank ends, letting you reduce shop downtime by switching blades quickly and without the need for any other tool. The other advantage of this feature is that it greatly reduces the possibility of blade breakage since there is no hole and locking screw. 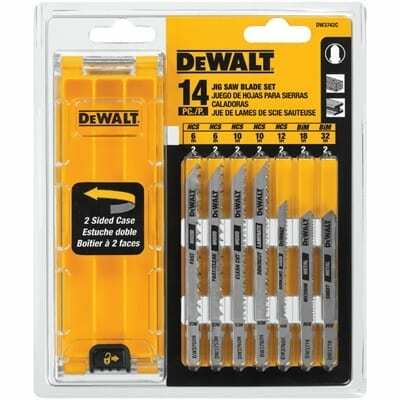 This 14-pc pack from DeWalt is one of the most versatile blade sets we have seen. By combining blades of different sizes, fabrication, and teeth configuration, DeWalt is able to produce a highly useful blade pack that has a little bit of everything. 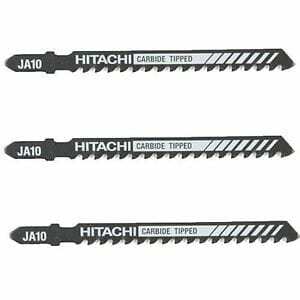 Hitachi’s blade set consists of three carbide-tipped blades that measure 4 inches in length and have 6 TPI. Such a low TPI is ideal for making coarse and fast cuts on thick, hard, and abrasive materials including fiberglass-reinforced plastic (0.25-in to 0.75-in thick), hardiboard, and cement-bonded particleboard (0.25-in to 0.375-in thick), among others. Hitachi’s confidence in the strength and durability of these blades easily show on the 5-year warranty. The carbide material that constitutes the tip of each blade equips them for heavy-duty cutting through the toughest materials. Combined with a low TPI of 6, the carbide-tipped blades can effortlessly slice through fiber cement and materials of roughly the same grade, thickness, and hardness. Nobody dislikes T-shank blades. They are compatible with more jigsaws than any other shank type and are also the most convenient to use because they can be replaced without the help of tools. It is quite easy to see what kind of DIY-er this blade set caters to. Unlike the other sets we have reviewed so far, Hitachi’s 3-pc set offers extremely strong blades to a relatively smaller market. These are heavy-duty blades that are up for some serious cutting. The T101AO3 consists of five wood cutting T-shank blades. This design fastens the blade to the saw on five points of contact, letting the jigsaw cut more powerfully. These 20-TPI blades feature a “durable precision design,” which maximizes the blade’s performance and allows it to make clean and smooth straight and curved cuts on laminates, laminated substrates, plywood, medium-density fiberboard, and the like. All three blades are compatible with 90% of all consumer and professional jigsaws out in the market today. Being made with HCS material, all five blades in this set are perfectly able to make smooth curved cuts easily. Moreover, since each blade has a narrow body and pointed teeth, they can be used even on delicate material without the possibility of chipping. The T-shank design of the blades allow for a quick and tool-free blade change, which is important if you are concerned about downtime. Also, the fact that there is no hole and no screw to mount means there is less probability of breakage. There is nothing right about making non-specialty blades that are compatible with only a very limited number of jigsaw models. We like how Bosch made this set usable with nearly every jigsaw you can get your hands on today. The five points of contact at the shank give the blade stability and allow you to cut more powerfully. When you use a blade with this kind of structure, you can focus more on what you are cutting than on worrying about your blade bending or breaking. Clearly, Bosch put a lot of thought into making these blades virtually invincible and available to everyone. 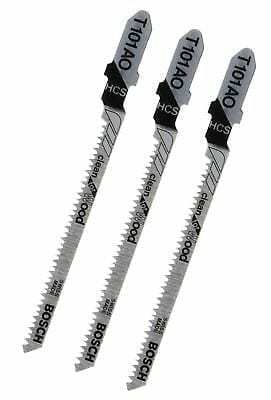 There is the durable precision design, the five-point-of-contact shank design, and the compatibility with most jigsaw models. However, it is still just made of HCS, which cannot be used for heavy-duty cutting and can wear out fast. Some customers did mention the design and the lock mechanism of the case, saying it is too easily opened and contains only six compartments although the blade set has seven pairs of blades. We believe that although this is a minus against DeWalt, it definitely has nothing to do with the quality of the blades, which an overwhelming number of reviewers commended. It looks like many agree that although the DW3742C is within the affordable blade price range, its blades’ quality is comparable to that of more expensive blades. This 5-pc blade set from Black+Decker is for general cutting applications on wood up to 2 inches thick. It makes smooth cuts and is compatible with all universal shank jigsaws. The pack contains a good assortment for most simple cutting needs and all blades are clearly labeled to help you determine which is which. Finally, since they are not too long, they have less possibility of bending or breaking. The unique thing about Bosch’s blade pack is the pointed teeth design, which reduces the likelihood of splintering or chipping when cutting delicate materials. The 20-TPI T101AO3 blades produce the best results when used for cutting double-sided laminates, laminated substrates, hard and soft woods, fiberboards, and plywood. If paired with a good jigsaw, they can make clean straight, curved, and scroll cuts. You may like the heavy-duty blade set from Hitachi. All blades are carbon-tipped, giving the blades extra strength and durability when cutting through the hardest, densest materials. With merely six teeth per square inch, these blades can make fast, rough cuts on abrasive materials such as FRP, fiber cement, and cement-bonded particleboard. Measuring 4 inches long, they can cut through materials up to 0.75 inches in thickness. The bi-metal construction of these Bosch blades combines the flexibility of HCS and the ability of HSS to cut through relatively harder materials. All three blades are ground, taper-toothed, and designed and optimized for straight and clean cutting through acrylic and similar materials. As with all bi-metal blades, these are built to last. Just like the T101AO3, this set features a pointed design for the teeth to prevent wood splintering during cutting operations. They cater to the same set of materials, which includes laminates, laminated substrates, plywood, and the like. They are ideal for scroll, straight, and curved cutting. Finally, this set includes 100 blades. The T10RC includes ground, reverse-toothed blades that can make clean and fast cuts through wood and plastic without the risk of top splintering. The 10 blades are: two precision for wood, six clean for wood (two of which are reverse-toothed), one Xtra-clean for wood, and one basic for wood. The nice thing about it is the heavy-duty plastic case that comes as an extra. Kent’s blade set also contains ten T-shank blades that measure 3 inches in working length. Since they are ground and side set, they can be used for both fine and rough cuts. All blades are made with HCS material that is highly flexible and can withstand heat. These blades are specially designed for making fast, curved or surface cuts through wood, OSB, and plywood. Similar to the T244D, these blades from Bosch are optimized for making fast, curved cuts in hard and soft wood varieties, OSB, and plywood that measure anywhere between 0.25 to 0.375 inches in thickness. They have merely 6 TPI and are made with HCS material, making the blades ideal for fast cutting and giving them a relatively longer lifespan. The T101B has five 4-inch blades that can be used for most cutting applications on plastic, hard and soft wood types, plywood, laminated particleboard, and the like. They make clean, straight, and fine cuts without splintering wood and can handle materials up to 1.25 inches thick. When looking for jigsaw blades, it is important to keep in mind what you normally use them for because even the slightest differences in measurements, designs, and even the number of teeth can adversely affect the quality of each cut. We hope this extensive guide on jigsaw blades has enlightened you about the best jigsaw blades available and continues to help you going forward.